You agree that your use of the Web site is subject to the following Terms and Conditions. These Terms and Conditions may be modified at any time and from time to time; the date of the most recent changes or revisions will appear on this page. Continued access to the Web site by you will constitute your acceptance of any changes or revisions to the Agreement. If you do not agree with the Terms and Conditions, please do not use this Web site. The materials contained on the Web site are provided by Perfect Smiles Dental Care as a service to you for your noncommercial, personal use on an “as is, as available” basis and may be used by you for information purposes only. You acknowledge that you are using the Web site at your own risk. 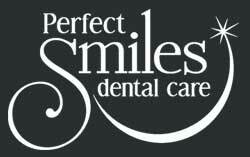 Perfect Smiles Dental Care assumes no responsibility for error or omissions in these materials. Perfect Smiles Dental Care no commitment to update the information contained herein. Perfect Smiles Dental Care makes no, and expressly disclaims any and all, representations or warranties, express or implied, regarding Perfect Smiles Dental Care Web site, including without limitation the accuracy, completeness, or reliability of text, graphics, links, products and services, and other items accessed from or via the Web site, or that the Web site will be uninterrupted, error-free, or free of viruses or other harmful components. No advice or information given by Perfect Smiles Dental Care or any other party on the Web site shall create any warranty or liability. Under no circumstances shall Perfect Smiles Dental Care or any of its parents, subsidiaries, affiliates, or their respective partners, officers, directors, employees, or agents be held liable for any damages, whether direct, incidental, indirect, special, or consequential, and including, without limitation, lost revenues or lost profits, arising from or in connection with your use, reliance on, or performance of the information on the Web site. All materials published on the Web site are protected by copyright laws, and may not be reproduced, republished, distributed, transmitted, resold, displayed, broadcast, or otherwise exploited in any manner without the express written permission of either Perfect Smiles Dental Care or, in the case of content licensed by Perfect Smiles Dental Care from third parties, the entity that is credited as the copyright holder of such licensed content. You may download freely accessible material (one copy per page) from this Web site for your personal and noncommercial use only, without altering or removing any trademark, copyright, or other notice from such material.